A few photos and notes relating to amateur radio friends from over the years. Click on the photos to see larger images. We visited recently (8/6/09) with friend and long-time ham operator, Frank Allen. 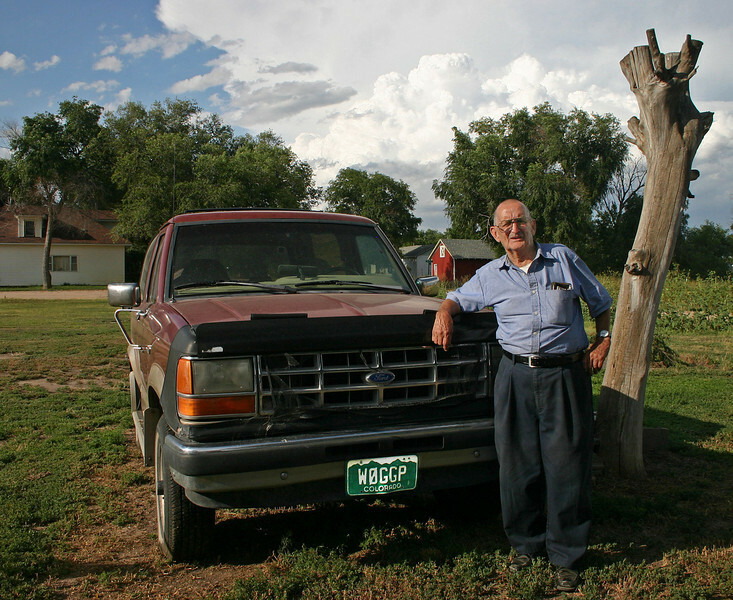 Retired from his 2-way radio repair business, Frank has lived in Padroni, Colorado -- for many years. We spent considerable time chatting about Frank's career in broadcasting, which took him to stations in Illinois, Wyoming, Colorado, and Nebraska. I met him at KCSR in Chadron. He and his wife, Marlene, acquired quite a bit of land in Padroni, accommodating a variety of antenna configurations. Marlene contracted West Nile virus and died in 2006. Frank (WØGGP) was a ham radio mentor for me. When I got my license in 1960, I immediately showed it to him. Without hesitation -- he assigned an unflattering phonetic for the new call -- WNØBDN. I won't tell!